I woke up in the village of Vandans. We drove to a tram station, and rode a gondola high up into the mountains. 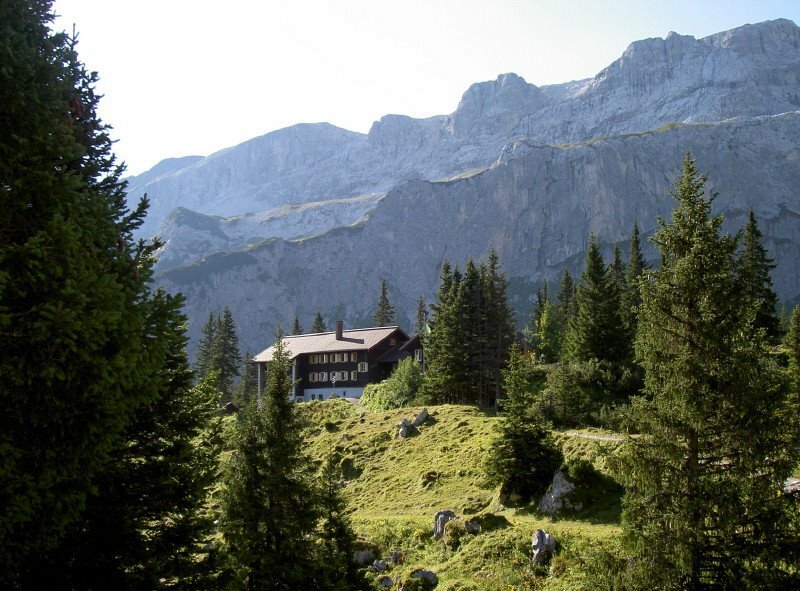 Our hike (german link- has a map of our route) to the Lindauer hut (german link) was a mix of ups and downs. 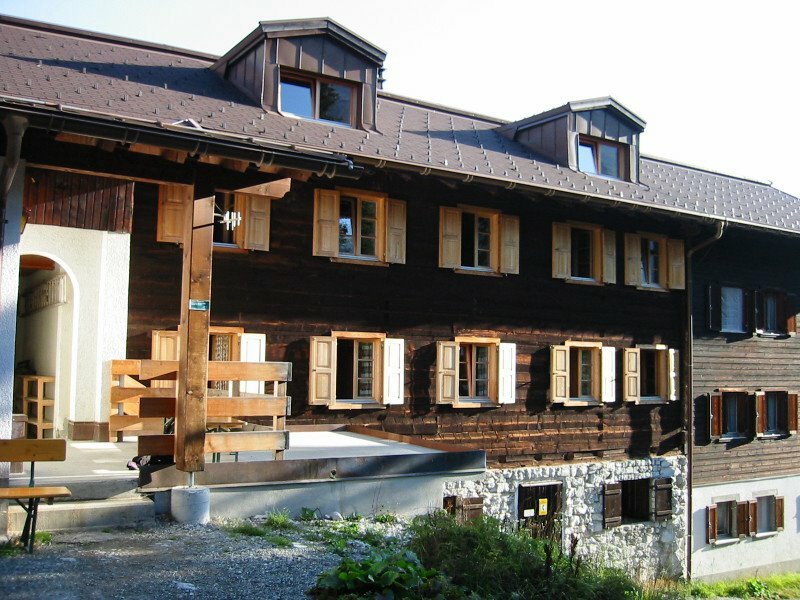 (A hiking club from Lindau maintains the hut). Beautiful scenery- all but a few hundred yards was above tree line. We passed a farm on the way, and lots of cows, their bells jangling in the fading light of late afternoon. When we arrived, the hut seemed fairly chaotic. It felt a lot like a hut in the White Mountains, but of course there wasn’t a word of English to be heard. 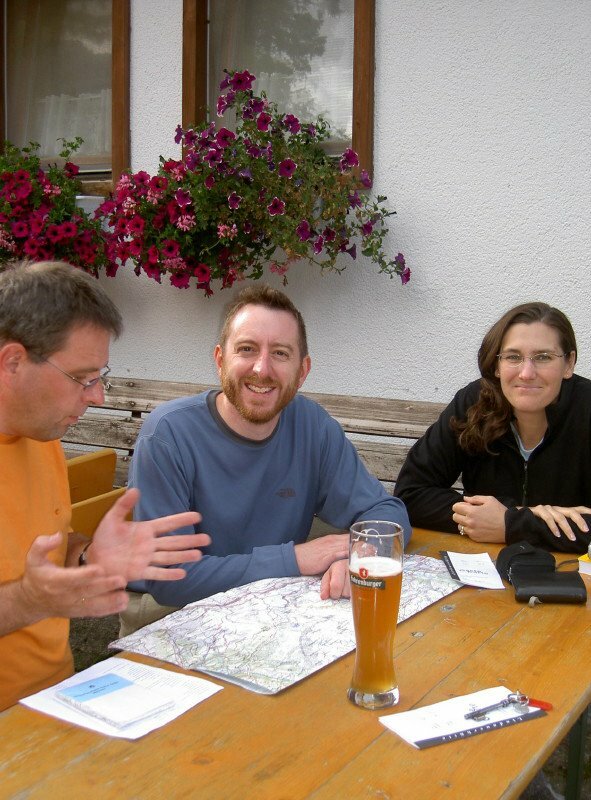 Having German hosts was very advantageous, though, and Dieter sorted everything out within a few minutes. The hut was quite a bit civilized by our standards- our private room had electric lights, and there was hot water and flush toilets. We washed up, put on warmer, drier clothes, and met outside for dinner. Dorinna had a cheese plate with cheese made at the farm we had passed on the hike there. I went for the pork with creamy mushroom gravy and curry rice. Three cold Weiss beers helped wash it down. We had a lot of fun making fun of the ridiculous contents of our German-English phrasebook. My earlier nap made it hard to fall asleep, which was just as well, as the shock of the smoke alarm an hour later was less of a jolt. It was a false alarm, of course, but quite loud. I kind of stood in the hallway like an idiot watching a German frantically trying to muffle the sound before I could finally dredge up enough German words to ask if I could help. He immediately switched to perfect English, and we kept the alarm covered until it was shut off a few minutes later.